Following are photos of what happens when governments, planners and cycling advocates lose sight of the safety and well-being of cyclists in their quest to promote cycling (or to appear to be “accommodating” cyclists). This IS the natural end result of the current facilities-first, cycling advocacy paradigm. It is what the mindless clamoring for bike lanes will produce. This lane is a right-turn-only lane for the entire block after the previous traffic light. A cyclist going straight should not be using this lane at all, and should certainly not be riding to the right of it. We teach the proper lane position and intersection technique in bike ed. We teach cyclists to think ahead and be where they need to be well ahead of time. We teach cyclists never to swoop. The paint on this road teaches the opposite. 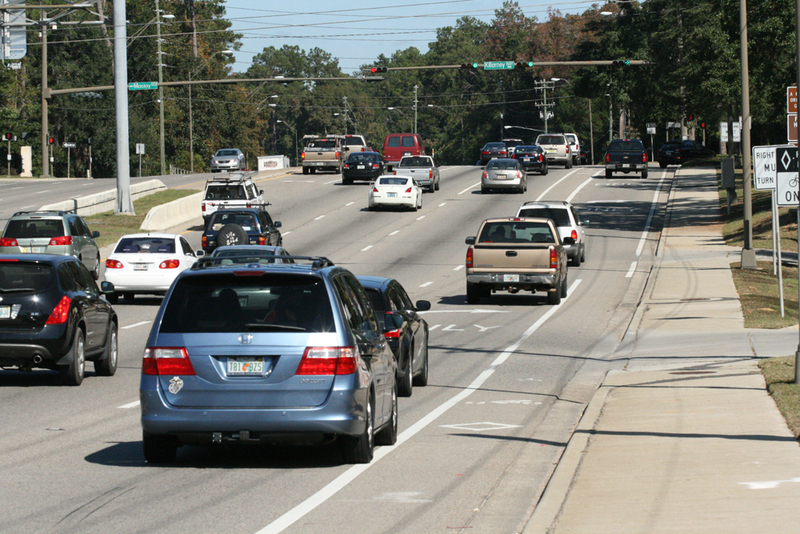 There are 6 right-hook invitations in the above satellite image of a Tallahassee arterial. 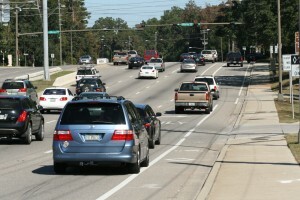 Three are bike lanes to the right of right-turn only lanes and three are bike lanes (striped solid) to the right of dual destination lanes with a high percentage of right turning vehicles. The bank entrance behind this photo also has a constant flow of right-turning traffic. It is simply not possible to segregate traffic by vehicle type in such a complex area. Doing so not only endangers cyclists, it lures novices who have no idea they are being endangered. That is unethical. The next series of photos are the antithetical follow-up to my last Smart Moves post. The video in my post shows the safest and easiest way to transition a freeway interchange. The pavement markings in the photo show — and lead cyclists into — the MOST DANGEROUS thing you could do at a freeway interchange. First, here is the signalized intersection immediately before the on-ramp to I-10. A large number of cars turn right here, the bike lane is striped solid to the intersection. This is the bike lane configuration at the on-ramp. The lane actually jumps across the on-ramp (on the other side of the truck). This interchange is under construction and the bike lane is obstructed under the bridge, so hopefully that will keep novice cyclists from attempting to ride through this area. 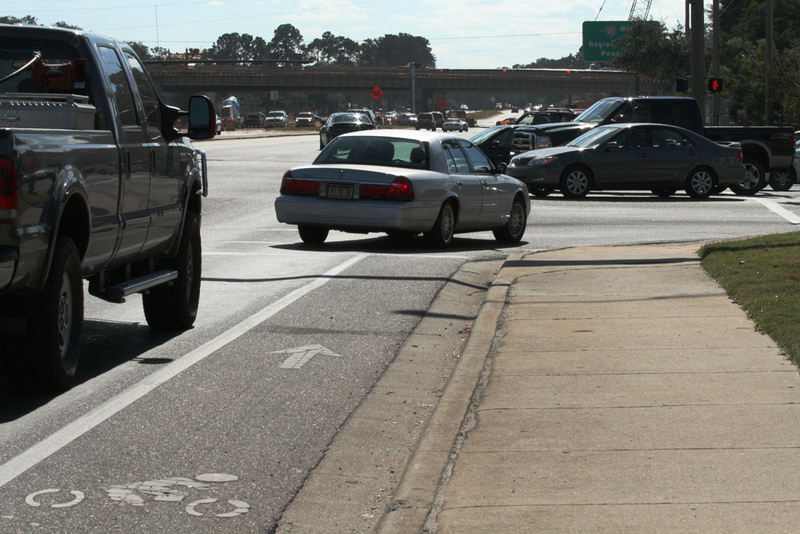 As with door-zone bike lanes, these suicide slots UNDERMINE the efforts of cycling educators. As we try to teach people to ride safely, the careless paint reinforces and encourages mistakes that could kill them! It doesn’t just lead novices into danger on this road, it leads novices into dangerous behaviors on every road. It teaches them the exact opposite of the right way to ride. It teaches all road users the exact opposite of how cyclists should ride. This is criminal negligence. It is reckless endangerment. It undermines education and principled advocacy. And you can mince around all you want about “good bike lanes” and “bad bike lanes” but the bottom line is, these disasters are virtually unavoidable when bike lanes are touted as the way to promote cycling. Governments and contractors cannot be trusted to do things right for cyclists when their bias is to keep us out of the way. It takes constant vigilance on the part of people who care about the rights and well-being of cyclists to protect them from the people whose primary interest is promoting cycling. It’s time to stand up and tell these people that we do not feel “accommodated” by being shoved out of the way at our expense! Cycling is a beautiful thing. Promoting cycling is a good thing. Building infrastructure which benefits cyclists and facilitates their mobility is an important thing. But there are many, many things we can—and need to—do to enhance cycling. Advocacy and promotion of cycling is far more complex than simply slapping down paint wherever there’s enough pavement width to do it. UPDATE: Read this post on CycleDallas, it’s an important companion to this post. Sometimes, I think they WANT to eliminate cyclists, not just get them out of the way. Simply amazing, and absolutely criminally negligent… a sober traffic engineer would never in a million years design a facility like that for a motorized vehicle, but will do it in a heartbeat (a lost one) for cyclists. What you’re seeing in most of these photos are violations of standards. 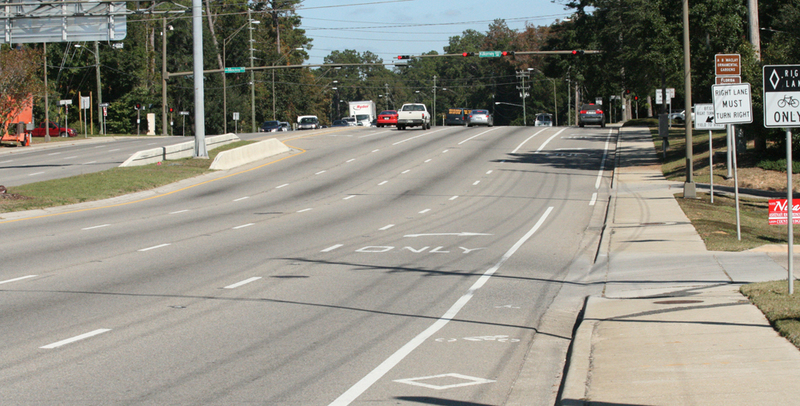 Whether it’s the AASHTO Guide, the Florida Green Book, or the Florida DOT Plans Preparation Manual, all direct designers to place bike lanes to the left of right-turn only lanes. A cyclist involved in a crash in such a bike lane has a nearly rock-solid case against the responsible government agency. Lawsuits are my business, as an expert witness, and yet it makes me wince to consider that they would be the best avenue for changing a bad design practice. What happened to wanting to do the right thing, without the threat of a lawsuit, or without the precedent of a successful suit against another community? It’s just not that difficult to design streets correctly. But it’s a pernicious fad to design them incorrectly. Working with Traffic Engineers, my challenge to them is always “never design a bicycle facility you wouldn’t design for a motor vehicle”. It stops crap (Latin for poor design) like these examples Keri has displayed. Better yet, it pretty much stops all bike lanes designs other than the ones that perform their original intent as a traffic control device for bicycles. Killer facilities designs are growing in regularity (“pernicious fad” as a superior wordsmith to myself says), urged on by the weight of the US’s most visible cycling advocacy organizations. Every facility I work on is approached with the idea that we must do nothing to endanger people, to lure them into a situation where their trust is unwarranted. We have now reached a state in far too many places where that public trust has been betrayed in the name of fashion. 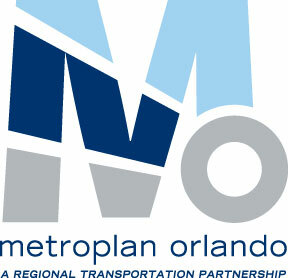 Anyone can speak and show photos at our MPO board and committee meetings. It’s going to be a long, long time until Lakemont needs resurfacing again. Maybe a slurry job in 5 years, though. 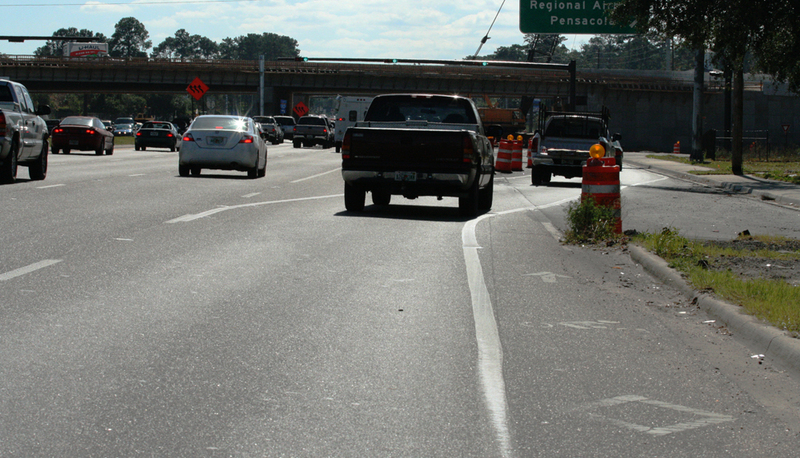 Lakemont has a striping issue at Whitehall (mainly an issue for northbound cyclists). Generally, as bike lanes go, Lakemont isn’t terribly offensive (I would prefer a WCL, of course). The real tragedy is Baldwin Park. These DZBLs are criminal, both in the immediate risk and the mis-education they provide. Since the city refuses to remove the lanes, they should at least caution-stripe them. Like this. Since they define the hazard zone, completely. There are several suicide slots in town, too. I know a few of them, Mighk probably has a longer list. Lyndy was actually able to get a few of them re-striped (or caution-striped) in the Oviedo area. I was in Debary last week and saw some double white stripes, maybe 18-24″ apart on some of 17/92. No idea what that is about. Looks like they are taking a 14′ outside lane and trying to make it 12′ by way of paint. I’ve ridden on that section of 17-92 many times. 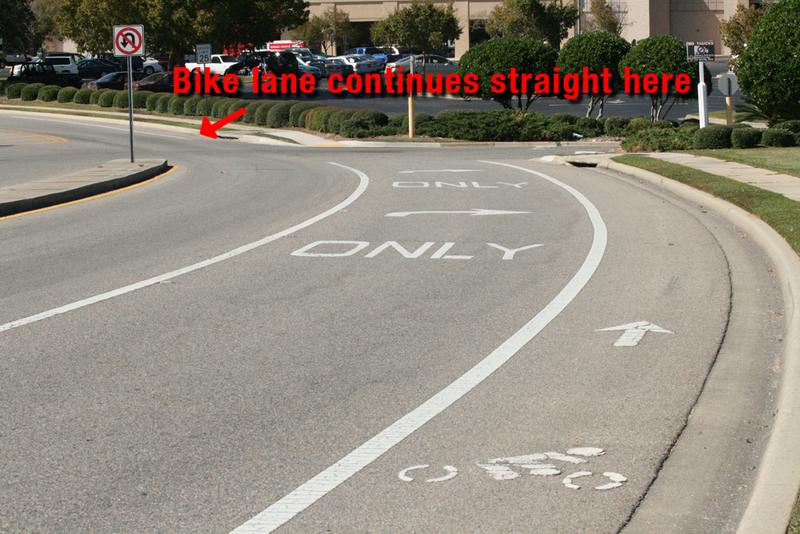 The width varies, but I think you’re right, it’s more a visual lane-narrowing scheme than a bike facility. The powers that be love their junk science justifications for that ’cause they get themselves a twofer. And sadly, most cyclists will ride on any amount of pavement to the right of a white stripe… even if it’s narrower than they are. 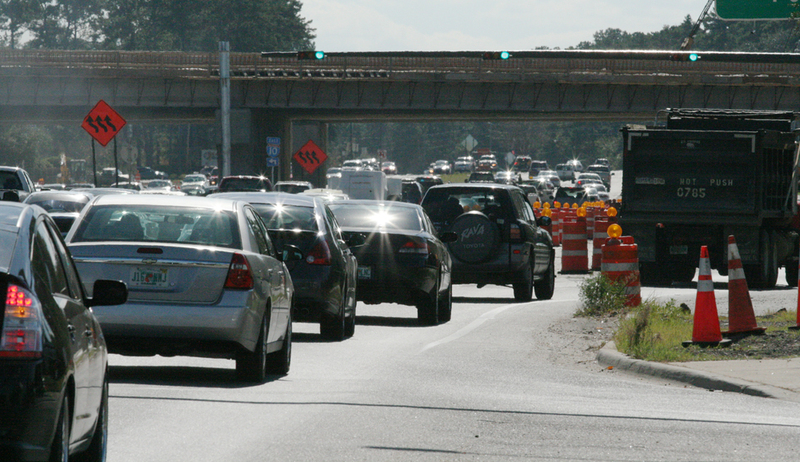 When we do our Blue Springs rides, we ride in the right lane and ignore the stripes. Yesterday I was in Oviedo and was surprised at the number of bikes lanes going right up to the intersection. Some have been sort of fixed, with a dashed line about 25 feet long, others not. That’s a State highway, just like 17/92 is in Debary, so this must be a FDOT thing. I don’t think FDOT let’s the cities touch the State highways. since moving here a few months ago i’ve been scratching my head trying to figure out how they come up with the bike lane placement. are they doing any studies on bike traffic patterns? there will be a bike lane and then bang, nothing! and then your screwed because pretty much that lane took you nowhere and now you have to share the narrow street with 35-40mph cars. Like the pictures above with the bike lanes on the right of a turning lane! 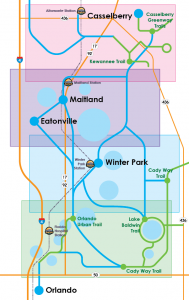 i live out in waterford lakes area and luckily i have a short commute to orange and princeton about 6 days a week and luckily i’m able to combine some trails into the commute or I would be stuck with lake underhill(bike lane for a short distance and then it narrows to a 2 lane road) or colonial which i would have to ride on alafaya with no bike lane until after colonial and then well, you know colonial(hell). I just dont get these lanes. it seems like they just do it when and where it is convenient. oh we have some extra space here, we will put a bike lane here. oh this cobblestone street has a smooth cement ditch on each side, lets make that a bike lane. Does this city promote bike lane usage? is it encouraging bicyclist to use the streets and bike lanes? magnolia bike lane going towards colonial seems that it has turned into a long turning lane for cars to just speed up to the light. everytime im riding and someone tries to speed up behind me in a car in a bike lane, i will slow down, not let them pass and point to the bike lane and then if i have the chance i try to talk to them same with people yelling to “get on the sidewalk” get out of the street” if i catch with them at a light i ask them why i should be on the sidewalk? then i explain 3 simple things. 1. more accidents occur when bikes are on sidewalks. 2. its called a sideWALK!! 3. its illegal to ride on the sidewalk in orlando! sorry, i’m just frustrated and venting. anyways im sure everyone has heard these before but if not here are a few suggestions that i’ve picked up from riding as a messenger over the years..
1. while riding close to cars either parked or in traffic, learn to use THEIR mirrors especially while riding in that danger door zone. i’m always looking in the car through rear window and also looking in the mirrors to see any movement. 2. make eye contact and when someone is polite then shoot them a nod or a wave. 3. ride like a car. these pictures are a prime example of HORRIBLE design! there might as well not even be a bike lane… I find it easier and safer to not even use the bike lane sometimes and this is a prime example. sorry again for the rant. 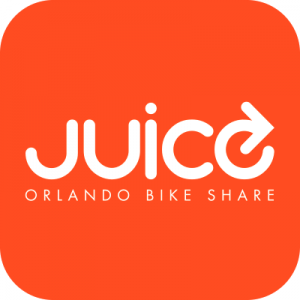 if there are any bicycle groups that are working with the city and planning boards please post it here because i would really love to get involved. Thanks! Nick, I understand your frustration. Our land-use patterns have really boxed us into costly and/or imperfect solutions. Once you get into the urban core, your choices increase and it’s easier to pick roads that suit your needs. But getting from the sprawl zone into town offers few options. Arterial roads pose problems for implementing bikes lanes because of the complexity of freeway interchanges and commercial districts. The greater the crossing and turning movements (conflict opportunities), the greater the need for a cyclist to avoid the space where bike lanes would be. A lane position which allows you to protect your safety and control your environment is much farther left than a bike lane. In such an environment, the opportunity for really bad compromises on the part of designers and/or deadly mistakes on the part of contractors is great. And the photos in this post show the common result. I have to agree above, i think they put the lane their to appear like they advocate bikers but in reality they really have no real desire to help or grow bikers, they just see it as more road ways to worry about even though they don’t take care of the road ways anyways. Avid Cyclist to Head Obama Administration Transportation Department How do we get more cyclists?